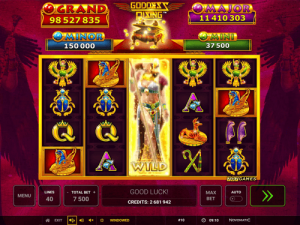 Goddess Rising is one of the new jackpot games from Novomatic. It’s quite similar to the other slots in the way that it works but the theme and the design is a little different. Novomatic’s other new jackpot slots include: Vampire Fortunes, Wild Bounty and Beach Holidays. The theme colours of Goddess Rising are purple and gold – two rich colours associated with royalty! The royals in ancient Egypt were known as Pharaohs. Pharaohs could be men or women and they were worshipped by their subjects as though they were demi-gods! Most of the Pharaohs were men, though. The most famous include: Tutankhamun, Amenhotep and Cleopatra. If you need any reminding of how much pharaohs were loved by the Egyptians, just look at the pyramids! These impressive structures were built as burial tombs for their beloved leaders. Although they were constructed many thousands of years ago, the remains can still be seen today. Along with these architectural gems, much of ancient Egypt has been preserved. Their writing system, their prized possessions, their religion and their death rituals – it’s all there and it’s all been studied! Egyptians loved gold and precious stones – all of which are depicted in this game. This slot is practically dripping in riches! The symbols are jewels set in gold and the jackpot chest is filled with gold coins! Even if you don’t get the jackpot in Goddess Rising, you can still win. You get paid wins when you spin the reels and identical symbols land in winning positions. Goddess Rising has paylines so the symbols that match up will need to follow these lines. The paylines move from left to right across the five reels. So the matching symbols need to follow the payline. This means, the first match must land on reel 1 and the others must follow, according to the path of the payline, on consecutive reels. A minimum of 3 matches is necessary for a payline to award the win – this is true for any symbol in the game. The face cards are the least valuable symbols. Paylines pay slightly less for the Jack and Queen pay than the King and Ace. The scarab beetle pays more and they increase in this order: the crook and flail, the reeds, the isis, the hound and the sphinx. You can play manually by pressing the start button to spin the reels every time. You can also play automatically if you’re in it for the long haul, so you don’t have to keep on pressing the button. When you’re playing automatically, don’t forget that you have to stop the reels after a win if you want to gamble it. The gamble feature is a 50/50 chance simple card game. Red or black? One choice will lose your win and the other will double it. In Goddess Rising, the jackpot is always rising! The jackpot is progressive and it grows and grows until it finally spills! Lucky players can get their hands on one of four jackpots. The smaller two, the mini and the minor jackpots are set amounts (depending on your bet). The bigger two, the major and the grand jackpots, are the progressive pots! The jackpot bonus game might begin at any time and each time, you can win any of the four jackpots when you play. You can also get bonus wins and bonus spins thanks to the Wild symbol. The Wild symbol is a beautiful Goddess who looks like the most beautiful Pharaoh. Her beauty can fill an entire reel, even if she only lands on one position! She can award free spins and she can transform into any symbol to complete a win. During the Free Spins, each time she helps to complete a win, she uses her powers to remove a symbol from the reels. She starts with the lower-paying picture symbols. They’ll be removed by her one by one until the reels are filled with only the most valuable symbol. This is an excellent feature as the free spins wins will just keep on getting bigger and more likely with ever Wild win!